We’d love your help. Let us know what’s wrong with this preview of Dawn of the Eagles by S.D. Perry. As violence all across Bajor continues to escalate, Cardassian forces tighten their grip on the captive planet, driving back the resistance at every turn; but on Terok Nor and elsewhere, the winds of change are stirring -- the beginnings of a hurricane that will alter the landscape of the Occupation. And while secret dealings, shifting alliances, and personal demons buoy the wings of revolution, a mysterious shape-shifting life form begins a journey that will decide the fate of worlds. To ask other readers questions about Dawn of the Eagles, please sign up. S.D. Perry and Britta Dennison do a great job with a challenging task in this final book of the Terok Nor trilogy. They had to tell us new and interesting things about the characters from the first two books and bridge them into the existing canon without every outcome feeling totally inevitable and lacking in suspense for fans. Although parts of the book feel a bit like just tying up loose ends, the exploration of some of the characters - particularly Kira Nerys and Natima Lang - still feels cre S.D. Perry and Britta Dennison do a great job with a challenging task in this final book of the Terok Nor trilogy. They had to tell us new and interesting things about the characters from the first two books and bridge them into the existing canon without every outcome feeling totally inevitable and lacking in suspense for fans. Although parts of the book feel a bit like just tying up loose ends, the exploration of some of the characters - particularly Kira Nerys and Natima Lang - still feels creative and fulfilling. One of the things I most appreciated about this book series was Perry and Dennison's contrasting of Bajoran and Cardassian gender norms. We see how the Cardassians' particularly rigid gender norms, where women are assumed to be better at sciences and men have a leading role in politics and the military, are arbitrary and hurt everyone. Doctor Mora experiences first-hand the kinds of comments Cardassians have for men in the sciences, and women like Natima Lang who eschew a scientific career and family are similarly discriminated against. "Natima winced a little at the last one, for there were women in the military as well as men, but Cardassia was still mired in patriarchy…As it was, she got plenty of disdain from her male colleagues at the Information Service, who had long tried to dissuade her from covering pieces that might place her in harm’s way." The descriptions of how Natima Lang's views changed from her early days of producing propaganda about the Occupation to becoming a dissident who has a relationship with Quark (which was mentioned in the series) are really interesting to read and feel totally understandable. If I had to change one thing about the Terok Nor trilogy I would’ve liked for there to be more focus on people’s feelings instead of only their actions. In Dawn of the Eagles there were a couple lines about how Odo and Dr. Mora were feeling that really stood out, but otherwise it was hard to get really emotionally involved other than what was already there from knowing the familiar characters and caring about the story. But overall the books are engaging and do a really good job telling us about Trek women we know, and introducing interesting new ones. The range of women characters is impressive and the way the books acknowledge how individuals and society are affected by gender roles is refreshing. As with the previous two books, I'm impressed (and a bit astounded) by the depth of detail and research in this book. I think this book followed the second very well, and kept the pace nicely. Overall I think this book series did a good job of giving characters believable viewpoints and motivations, as well as setting up events in a way where they seemed like plausible outcomes instead of seeming random or forced by the plot like sometimes happens in books. My only real complaint is that it's som As with the previous two books, I'm impressed (and a bit astounded) by the depth of detail and research in this book. I think this book followed the second very well, and kept the pace nicely. My only real complaint is that it's sometimes difficult to get emotionally invested in the characters here, especially the more minor ones, since they can go for great lengths of time without being seen again, or (more rarely) finish their purpose to the story and kind of fall out of the narrative. However, I think that was probably unavoidable given that these books span over half a century, on two main worlds, several colonies, moons, and other assorted locations. It's also probably fitting...these books do a great job of presenting things realistically, without glamorizing anything, so it makes sense that (as in real life) not everything gets neatly resolved or explained. I do like the way the book ended, especially. That moment between Odo and Kira was nice, and really shows their beginning friendship. The days are dark for Bajor. More than thirty years into the Occupation, the once-promising Resistance has very nearly been broken by a planet-wide surveillance system that restricts the movement of Bajorans on the surface. Some of the rebellion's best leaders have fallen victim to it, and there seems to be little to do but hide in what few caves and similar sanctuaries that remain hidden from the Cardassian state's sensors. And yet resistance festers, not only a stripped Bajor but among the Car The days are dark for Bajor. More than thirty years into the Occupation, the once-promising Resistance has very nearly been broken by a planet-wide surveillance system that restricts the movement of Bajorans on the surface. Some of the rebellion's best leaders have fallen victim to it, and there seems to be little to do but hide in what few caves and similar sanctuaries that remain hidden from the Cardassian state's sensors. And yet resistance festers, not only a stripped Bajor but among the Cardassians as well. Religious dissidents, ordinary citizens, and even members of the military are weary of the toll occupation has taken on Cardassia: decades have been squandered in which Cardassia could have fostered a sustainable economy, wasted instead on the short-term remedy of taking Bajoran wealth. But now Bajor is largely ruined and the occupation nearly costing more than it provides -- in lives and finances. Even the architect of despair, Gul Dukat, pays the price for his Pyrrhic victory, increasingly isolated and made miserable by the fact that no one really appreciates him. Dawn of the Eagles chronicles the downfall of the Cardassian occupation, completing this epic of Deep Space Nine's backstory. Mixing the familiar and the new, it is the story of a people's liberation; the Bajorans, from Cardassia; the Cardassians, from the depravity that Empire has led them to. A thoroughly enjoyable end to the trilogy, detailing the end of the Bajoran occupation. It's worth noting though that by this book the story feels more like a constant series of short vignettes rather than a complete tale. Much like the last book, the narrative jumps around every couple of pages and includes a huge cast of characters. It completely assumes that the reader is already familiar with everyone involved, as we don't get introductions. But once again, I'm impressed with how much effort A thoroughly enjoyable end to the trilogy, detailing the end of the Bajoran occupation. It's worth noting though that by this book the story feels more like a constant series of short vignettes rather than a complete tale. Much like the last book, the narrative jumps around every couple of pages and includes a huge cast of characters. It completely assumes that the reader is already familiar with everyone involved, as we don't get introductions. Fantastic novel that ends the series on a high and smoothly transitions into the DS9 series. All the threads are nicely closed off and we get to see a lot of back story to what we see on DS9. S.D. Perry and Britta Dennison bring the Terok Nor trilogy to a fine close with “Dawn of the Eagles,” a grandiose novel detailing the last decade of the Cardassian occupation of Bajor. The novel grows organically from the duo’s previous installment “Night of the Wolves” while keeping in mind the patterns put in motion in the series’ first volume “Day of the Vipers”. James Swallow created a somewhat clinically analytical beginning in “Day of the Vipers,” immersing the reader in political processes S.D. Perry and Britta Dennison bring the Terok Nor trilogy to a fine close with “Dawn of the Eagles,” a grandiose novel detailing the last decade of the Cardassian occupation of Bajor. The novel grows organically from the duo’s previous installment “Night of the Wolves” while keeping in mind the patterns put in motion in the series’ first volume “Day of the Vipers”. James Swallow created a somewhat clinically analytical beginning in “Day of the Vipers,” immersing the reader in political processes. When Perry and Dennison took over they maintained all of the political intrigue but added a rich layer of psychology to illuminate the nature of oppression. Now they manage to keep all of that along for the ride but add yet another, broadly sociological and philosophical layer to the mix. The genocidal nature of the occupation is fully confronted here, making this a powerful, effective but uncomfortable piece to read. The mind’s ability to detach itself from experienced and inflicted horror defines the novel. As the inevitable release of immense tension nears and the occupation starves in its gluttonous cruelty the personal experiences of the characters turn more and more intense, calling for more and more denial. This book (and series) has a lot of great qualities and a few big meh qualities. The authors of the 2nd and 3rd books really understand the characters, and characterization is pretty much perfect throughout (1st one not so much). They have a lot of canon they have to fold in and they do that really well with a great attention to detail. It illuminates how horrible the occupation of Bajor was and how much the Bajorans have gone through, so you can understand them a bit better. The downsides for m This book (and series) has a lot of great qualities and a few big meh qualities. The authors of the 2nd and 3rd books really understand the characters, and characterization is pretty much perfect throughout (1st one not so much). They have a lot of canon they have to fold in and they do that really well with a great attention to detail. It illuminates how horrible the occupation of Bajor was and how much the Bajorans have gone through, so you can understand them a bit better. The downsides for me were that it was a bit dry in terms of writing style (lacked any shred of humor), and suffered from too many povs and sidecharacters throughout. They shouuld have picked 4 povs at the very most and stuck to them, but instead we bounce around through the heads of almost everyone that has a name, and that's not very fun. As soon as you get into one scene, it changes to something completely different. There are a lot of characters either not in the show at all or who have very minor roles, and its really difficult keeping them all straight, especially when they are all in the same occupation such as "resistance fighter" or "cardassian dissident"
I didn't realize until I was almost through reading this book that it was not a standalone but is instead book three of a series. That explains why I had a hard time getting into it at first. That said, it is a very good story and mostly well written. (Probably very well written, just not in a style I particularly enjoyed.) It seems a lot like the Star Trek shows, in fact. The story jumps around a lot to different characters' points of view to tell different stories which sort of loosely weave t I didn't realize until I was almost through reading this book that it was not a standalone but is instead book three of a series. That explains why I had a hard time getting into it at first. That said, it is a very good story and mostly well written. (Probably very well written, just not in a style I particularly enjoyed.) It seems a lot like the Star Trek shows, in fact. The story jumps around a lot to different characters' points of view to tell different stories which sort of loosely weave together but not wholly. That's my perception, anyway. An eminently satisfying conclusion to the Terok Nor trilogy. While the final push by the Bajoran resistance leading to the Cardassian withdrawal felt a little rushed, the true heart of the story was what really counted: the characters. Perry and Dennison have a great feel for what makes these characters tick, and that expertise came through on every page of Dawn of the Eagles. As a whole, the Terok Nor trilogy was a rewarding read for someone like me, who is a very big fan of Deep Space Nine. Thi An eminently satisfying conclusion to the Terok Nor trilogy. While the final push by the Bajoran resistance leading to the Cardassian withdrawal felt a little rushed, the true heart of the story was what really counted: the characters. Perry and Dennison have a great feel for what makes these characters tick, and that expertise came through on every page of Dawn of the Eagles. As a whole, the Terok Nor trilogy was a rewarding read for someone like me, who is a very big fan of Deep Space Nine. This trilogy of books makes an excellent companion piece to both the Deep Space Nine television series and the "relaunch" post-finale novel series. A satisfying finale to the DS9 historical trilogy...and it only loses one star because the final Bajoran push to force the Cardassians off their world seems very much a behind-the-curtain, anti-climax that SHOULD have been showcased. It leaves a "what just happened" after-taste at odds with the rest of this fine novel. Good enging to the saga of Bajor and Terok Nor. I'm a bit diasppointed that the ore-processing station that'd later become Deep Space 9 didn't play a bigger part in the story, as the series is named after it after all. I loved the complexity of the Cardassians and their society, the Oralians and their faith made a good comparison to the Bajoran religion. Five stars, if only because I couldn't put it down. It was a brilliant conclusion to the series, and showed the latter 15 or so years of the Cardassian Occupation well, highlighting the victories and defeats, as well as the people behind them. Some of the chapters were quite short, but it all balanced out in the end. I quite enjoyed the various tie-ins to episodes in the series. 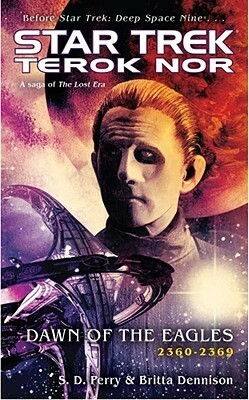 Not as good as "Day of the Vipers", but better than "Night of the Wolves", this book tells the story of Odo's development and becoming an investigator on Terok Nor, as well as the end of the Occupation. I also recommend this book to DS9 fans. This review has been hidden because it contains spoilers. To view it, click here. Really disappointing conclusion to what should have been an incredible series. SD Perry (Stephani Danelle, by the way, though she prefers SD or Danelle) has been writing novelizations and tie-ins for most of her adult life. Best known for her work in the shared multiverses of Resident Evil, Star Trek, and Aliens, SD is a horror nerd and an introvert. Her father is acclaimed science fiction author Steve Perry. SD lives with her family in Portland, Oregon.